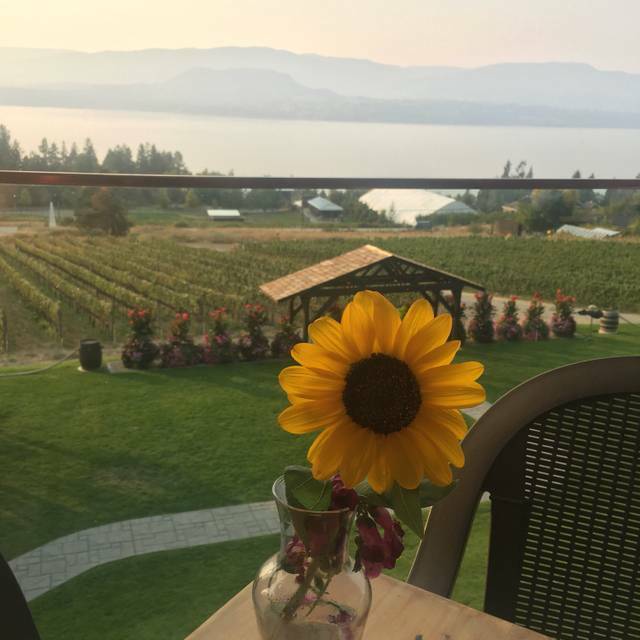 Summerhill Pyramid Winery's Sunset Organic Bistro has unparalleled views of Okanagan Lake. The Bistro is the perfect venue to experience the wonderful marriage of organic food and wine. 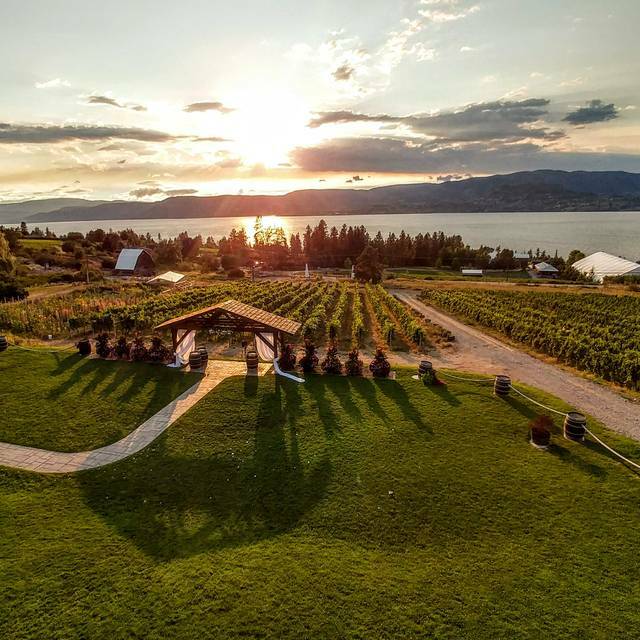 Summerhill Pyramid Organic Winery has a selection of venue catering for all functions and budgets from 250 person weddings and corporate presentations, to private dinners for 10. Everything from plated wine paired Winemaker’s dinners to stunning buffets for groups from 15 to 250 persons, with room for bands, DJ’s and dancing is offered. Wine and cheese receptions, or unique winery wide gourmet meal events for groups from 200 to 500! From fun, casual events to formal custom gourmet dinners, we can cater to any group or event. On property parking available for tour buses, limos and private vehicles. Summerhill is the ideal location for an unforgettable wedding, convention, dinner, tour, or any special event you desire. Experience the superior service, award winning wines and gourmet cuisine of Summerhill. We offer a wide variety of venues for your special events. There is the Summerhill Sunset Glass Room, The Sunset Veranda, The Pyramid and Vineyard Terrace, all with their own unique style. They could not find the reservation and then put together a table in front of the kitchen where it was noisy and could hear everything going on behind the scene. We love Summerhill! The three course meal was a great value and with so many options! The lamb shank did not disappoint. Service was great and we left with some really nice wines. Can’t wait to go back. What a great place for a lunch date - the location, view, food and service can’t be beat! Top gegeten vegetariër kan zn lol op! De calimary vegi helemaal top! Dine Aroound menu the best value in town. Great food. Great live music. Great night out. Thank you. For its organic wine and stunning views. It was dark when we went and it was very cozy. Food was fantastic. Amazing! Catered to my vegan needs and gave me a little something extra for free for my birthday. Fantastic customer service and amazing food including wonderful appies like the vegan cheese board! Went for the pizza night and had great food and service. The Greek chicken pizza was excellent; the asparagus one was a little bland, but we tend to like strong flavours so more our issue than anything wrong with the pizza. The Pinot Noir at retail price was an excellent choice with the pizzas and we appreciated the starter salads being included. I wish I had noted our server’s name as he was great, particularly as he was also looking after a Christmas party group that night. Always a treat to go to Summerhill and we are lucky to live just round the corner. We live minutes away so it's nice to have such an awesome spot to take family & friends for a nice meal & some good wine. Our second visit this year and another superb meal. Saxon, our server, was attentive and very helpful with advice on the menu and wines. All six of us agreed the food was excellent with char, bison and lamb being the dishes we selected. Thanks for a great evening. The quality of the food was absolutely outstanding. I had the char and it was the best fish I've ever eaten. The service was superb - from the time our order was taken to table delivery. The atmosphere was quiet, yet the restaurant was full. It was lovely to carry on a conversation over a fabulous meal. I highly recommend this restaurant to anybody who values fine dining. Everyone in our lunch party enjoyed the food, setting, service and experience. Looking forward to visiting again. 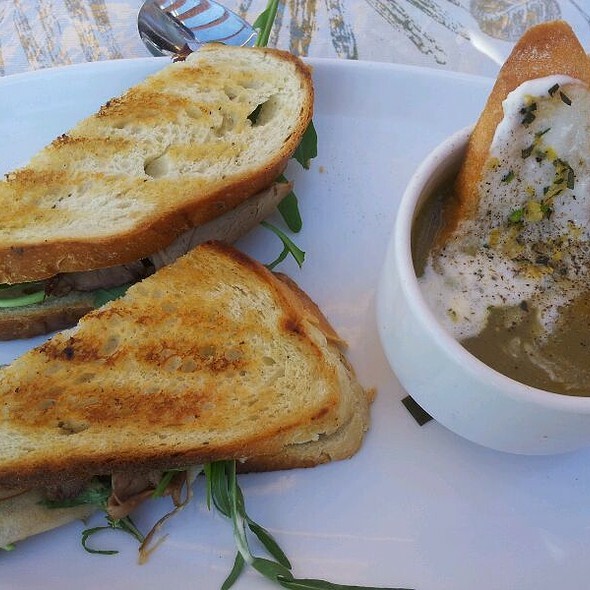 The Burger is tasty, soup of the day creative and fresh all of which paired nicely with the Cipes Brut! Had a nice meal on Saturday night. Low lighting, friendly waitress. She was very honest about menu choices. Summerhill needs to update their menu on the website as it is not current. We had a very pleasant lunch with friends. The food was very good, wine excellent. Views from the patio were tremendous on a sunny Autumn day. I ordered a burger, no bun. Half fries and half salad. The fires were mediocre. Salad was OK. The meat came on a bed of lettuce which is fine. The burger was completely over cooked and had almost no moisture. I would have sent it back but we had a deadline. The aggravation was added to by the next table over getting 2 burgers served that were pinkish in the middle and juicy. The 2 fellows were clearly enjoying them. There were only 2 servers which was not enough. Ours was great. My wife enjoyed her pear salad. Our group of 4 just visited this past weekend and the food was really fabulous. The view is spectacular and so was the service. Definately a must try when you visit Kelowna. Food was delicious and the wine was great! We sat outside with a small fire and blankets on our table to keep warm. Such a cozy and warm dinner. The view was excellent too! Wonderful ambiance, great food, delicious wines and incredible views of the valley. We usually dine as a family. Summerhill treated us all as valued guests. The food was delicious. The view is spectacular. This will join our favorites list. Holidaying in Canada, read the reviews on trip adviser. The place lived up to expectations. Great service and delicious food. Nice to have a waitress who was knowledgeable about the wine. Got a bit noisy when the restaurant filled up. We went here on a Sunday for my husband’s birthday. We shared the Sautéed humboldt squid to start. Very tasty. For our mains, I had the lentil Wellington and my husband had the Char with shrimp risotto. Both were fantastic! The service was excellent as well. We were disappointed at our experience. We arrived at 7 pm. We ordered our food. It did not arrive until 8:30 pm. Our drinks arrived and then we did not see anyone for one hour. Finally a server came by to tell us our plates had gone to another table. They gave us two glasses of sparkling wine. I asked if we could at least get some bread while we waited. Our food finally arrived 30 minutes later. Actually, we were ready to leave if our food did not come out by 8;30. My husband ordered tenderloin that was unevenly cooked and that he couldn't eat and returned. Mine was Arctic Char and it was fine. All the while we waited, tables around us were served. In the end, we did not pay for the tenderloin and they gave us a a free bottle of their sparkling wine. While we appreciated the gesture, we were disappointed that they could not communicate with us earlier to let us know own what was taking so long. Meals are not inexpensive at this restaurant and we booked it because it was my birthday. We hope that in the future the staff can be more attentive to the customers and not leave them waiting for 90 minutes for a meal. The menu was limited with few affordable options for entrees. The servings were rather small and expensive but what there was of the meat or fish was delicious. We found the wine overpriced given the wine shop is on the premises. We were glad to hear that a more affordable option may be returning to Summerhill which is the Tuesday night specials. The view really is spectacular and one of the reasons we like to take out of town guests. Given it is one of the few restaurants in the area it would be nice to see that it could be appreciated by more locals by having more affordable options. 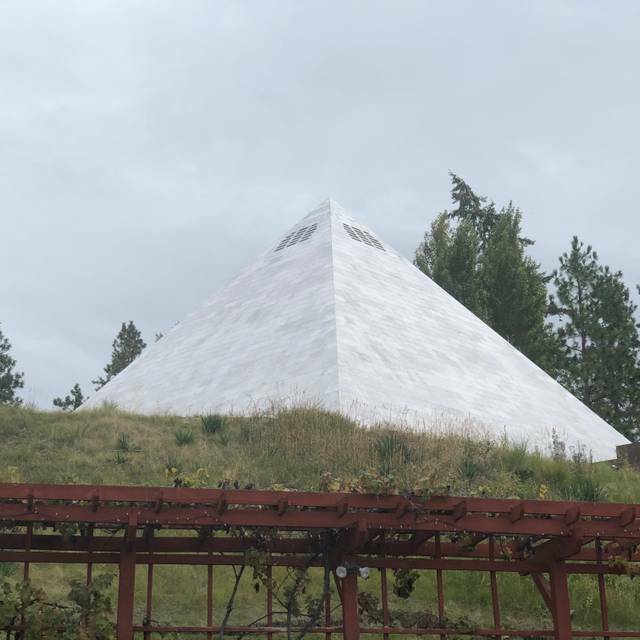 Our meal was excellent at Summerhill Pyramid Winery. Great Food, Great Wine & Beautiful Views! Easy to find and the scenery was beautiful. I would recommend you make a reservation since there were a couple of tour buses when we arrived. We had reservations so we were able to get in. Pleasant ambiance, good service, nice views, friendly staff, good food but disappointed they had no lake fish options. Nothing overly creative or must have but all well prepared. Hm. This meal was a bit of a disappointment. We chose it because we had a number of vegetarians with us and Summerhill has real veg options on their menu (actual choices!). The service was really lacking - our server provided a table of 9 people with only one drink menu, took ages to take our order, and had no familiarity with any of the wines. The meal itself came out in bits and pieces - 3 people were served, then another two, then the final 4. By the time I started eating (I had been among the first served) my meal was lukewarm at best. The food itself was extraordinarily overpriced for what was served, and this is coming from someone who eats happily at higher-priced restaurants like Waterfront or Raudz. My meal, the "Lentil Wellington", was dry, the vegetable portion was very small, the puree on the plate was tasteless, and everything was considerably under seasoned. The bison meal that a number of guests ate - which was a $50 plate - came looking very sloppy - random pieces of bison (it was called a "ribeye", but came out in 3-4 pieces all haphazardly thrown on top of some vegetables) which were cooked well but otherwise pretty un-notable. The dessert was a complete disaster - advertised as "Black Forest Cake", the description said there would actually BE cake, with compote and gelato and etc, but what arrived was a literal bowl of dry crumbs (like cookie crumbs that weren't good), some little log of mascarpone or whipped cream, and a blob of ice cream. I overheard the waitress tell another diner at the table that they had run out of cake and so were providing a deconstructed version, but not everyone at the table heard that and there was a lot of laughing about what it was we were served. Overall the meal was a bit of a joke, to be honest. 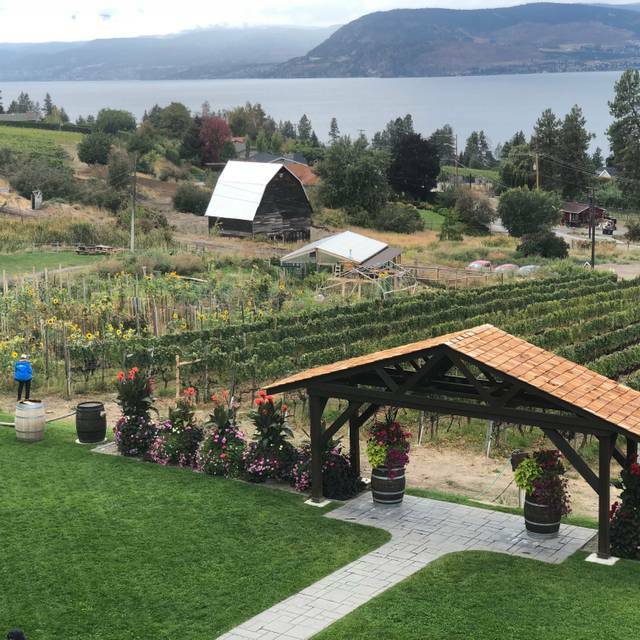 Lots of wineries in Kelowna aspire for a "fine dining" restaurant and then can't actually execute, and Summerhill is definitely one of those. Location and ambience are great, potential is there, but give this one a miss. Yes, Summerhill is a real Gem! In side and out. I've used Summerhill for an annual biz. lunch for the past 5 yrs in a row. Exceptional service, great food, and a very nice view. great view and service. food was good. my steak was a bit tough. will try again though as the deck seating is amazing! 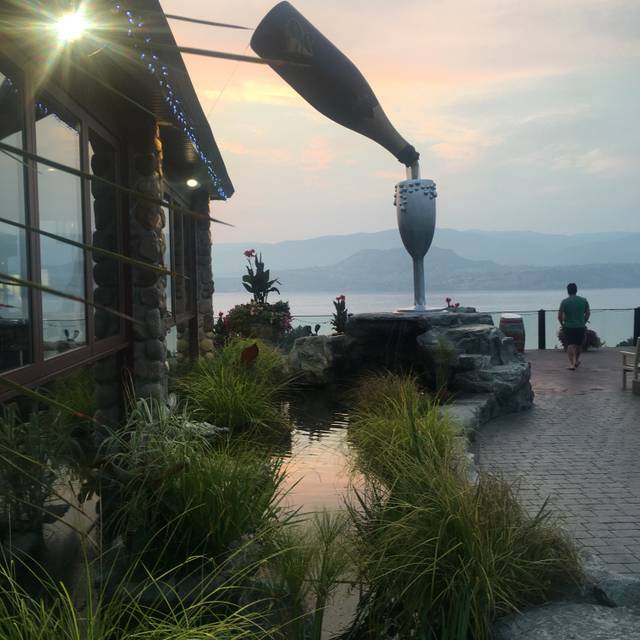 Great table service, excellent wine, romantic ambience, spectacular views and live entertainment (on Tuesdays) - the recipe for a great evening dinner! I can only recommend! It has been a year or 2 since my last visit. It is sad to see what has happened to the quality of the dishes served. It seemed like the kitchen had ran out of the items being sold in the menu. Portions were very disappointing and embarrassing!!!! As usual, the food was great and the dining experience was most enjoyable.